The deadbeef random number generator is a simple pseudorandom number generator (PRNG) that generates 32-bit pseudorandom numbers, with heavy use of the constant 0xdeadbeef. It's simple enough that one can learn the code by heart, and implement it whenever a simple PRNG is needed. The generator is fast and does well on a number of tests I've put it through, but I make no claims about the suitability of the generated numbers for any purpose. Results of analysis and suggestions for improvement are welcome. Below is the C code for the deadbeef random number generator. Feel free to use the code in your own software. Attributing the code to me and sharing any improvements you make would, of course, be appreciated. The tests below have been carried out using the C implementation given above, but the implementations in other languages yield the same results when initialized with the same seed. In an effort to establish if the deadbeef random number generator is any good, I've run it through a number of test programs. I would like to emphasize that I do not consider myself to have enough knowledge of statistics to do a proper analysis of pseudorandom number generators, so, please, do not attach too much importance to these results. First, I generated a file containing 223 (8388608) numbers generated by deadbeef. This took 3.24 seconds. For comparison: rand() from glibc took 4.60 seconds to perform the same task. Then, I fed the file to an image generator, which generates images that give an indication of how uniformly the generated numbers are distributed. 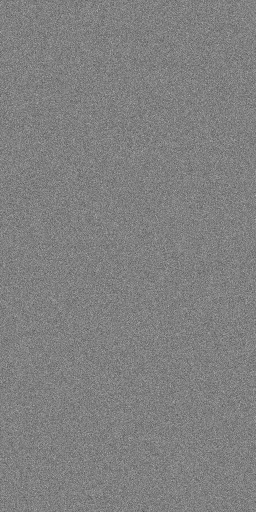 The image conists of two 256 by 256 pixel areas that are initially black. Each random number is broken up in its lower 16 bits and its higher 16 bits, and each of these parts is used as an index in the image: the lower 16-bits are used as an index in the upper part of the image, and the higher 16-bits are used as an index in the upper part of the image. The two pixels designated in this way are increased in intensity. For a uniformly distributed sample, this results in a uniform, grey image. As you can see, it's pretty uniformly grey. This is good. Since all probabilities are very close to 0.5, there is about an equal chance that any bit in a generated number will be a 1 or a 0. This is good. As a final test, I had a program compute the correlations between bits in subsequent numbers. For each bit in the current number and each bit in the previous number, the program calculates the probability that they are the same. This is scaled on an interval from -1 to 1, where -1 means that the two bits are always complementary, and 1 means they are always identical. The program prints the 32 strongest correlations (furthest from 0). Since all of these numbers are fairly close to 0, it's very hard to predict the next number deadbeef will generate based on the current one. This is good. Below is the output of rngtest (from rng-tools). There are many successes and few failures, and the scores for monobit, poker, and the runs are low, which is good. The file diehard.out contains the output of the Diehard Battery of Tests of Randomness. If you know how to interpret these, please let me know. I've been told that the p-values are supposed to be more or less uniformly distributed (just as much probability of being in the 0.1 through 0.2 interval as being in the 0.7 through 0.8 interval), and there shouldn't be too many of them close to 0 and close to 1. This seems to be the case in all but the operm5 and count the ones for specific bytes , and squeeze tests.